This is the story of Leonardo's horse - A sculpture which Leonardo da Vinci was commissioned to build but couldn't complete it. Ludovico Sforza, (also known as Ludovico il Moro), Duke of Milan, Italy, had patronised da Vinci and had taken him in his service. One of the main tasks he had assigned to Leonardo was to build an enormous bronze horse as a monument to his father Francesco Sforza. Leonardo however was busy in making his masterpiece painting 'The Last Supper' and series of other paintings and designing various engineering/weapons drawings and neglected to do any major work on the statue. Though he did a detailed study of the anatomy of the horses and made some sketches for the planned statue. Finally after 17 years of initial request he produced a giant clay model - standing 24 feet (~ 7.3 metres) high. At that time, it was the largest equine statue ever built and became known as the "Gran Cavallo". Leonardo started making plans for the final bronze cast, in single piece, for which he had reportedly designed special method and recorded about it in his carefully kept notes. Almost five centuries later in 1978, Charles Dent, a foundry owner of Allentown, PA, USA read about this unfinished horse in National Geographic, and being a collector of art, founded an organisation - 'Leonardo da Vinci's Horse, Inc.'(LDVHI) to finance the project for completing the unfinished task based on the designs of the great da Vinci. Initially he himself tried to make a life sized clay model which became known as "Charlie’s Horse". However it soon became apparent that any larger statue built using the partial notes and drawings of da Vinci may not be stable due to missing sketches and non-proportional/anatomical problems. Consequently, Nina Akamu was hired to modify and improve the Charles Dent's sculpture. The whole project not only took long time to complete but also proved costly - about US $ 2.5 million. Unfortunately Charles Dent died in 1994 and didn't live to see the completion of his pet project. Ultimately not one but two huge (24 feet) bronze statues, two smaller bronze casts (8 feet and 12 feet respectively) and several smaller souvenir statues (for fund raising) were built based on the original conceptual design of the great da Vinci. American billionaire Frederik Meijer was the major contributor for the cost of the second horse and a few small ones. The two colossus horses made of Silicon bronze alloy, were cast at Tallix Art Foundry, Beacon, NY, weigh 15 tons each and have been engineered to withstand earthquake and high velocity winds. 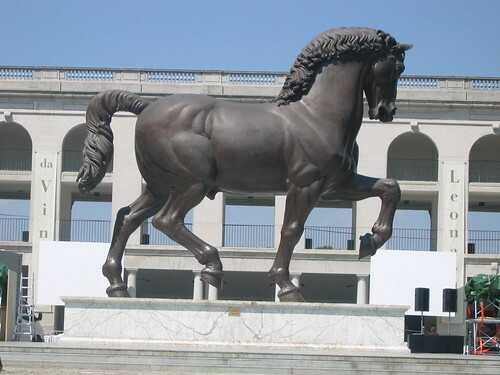 Besides the bronze statues made under the aegis of 'Leonardo da Vinci's Horse, Inc.' (LDVHI) another full sized 24 feet high equine statue, but of a different artistic interpretation of the da Vinci's designs, was constructed in 2007 by Opera Laboratori Fiorentini SpA in collaboration with Polo Museale Fiorentino and the Institute and Museum of the History of Science in Florence, Italy. 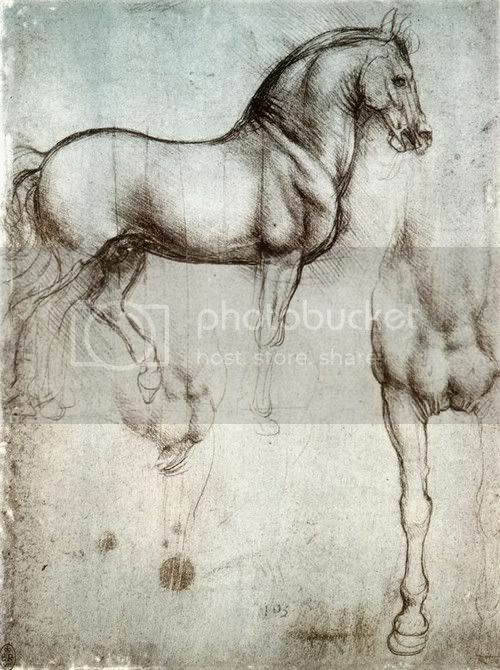 Several web pages claim that this horse is the real representation of da Vinci's original design. It is made of steel frame with special resin coated fibreglass, to make it look like bronze. In this post I have tried to locate all these horses. The correct name of the gigantic horse is "Il cavallo dello Sforza" (meaning: The horse of the Sforza) however it is referred by many names, depending on where it is located - 'Il cavallo', 'Leonardo's horse', 'The American Horse', 'The Sforza Horse', and 'The Sforza Monument' etc. While describing the locations I have added the words 'bronze' and 'fibreglass' to differentiate between the two designs. The first horse known as 'Il cavallo' was unveiled on 10th September 1999 - Exactly 500 years after destruction of the original colossal clay horse created by da Vinci. It is located at a specially designated Cultural Park, near the Hippodrome, in San Siro, Milan. 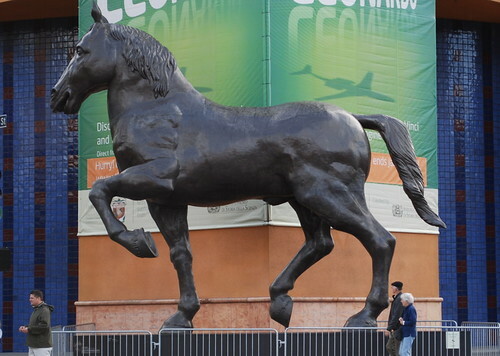 As per the web page of its sculptor, the horse is likely to be moved from the existing position near the racetrack to the park grounds at the Sforza Castle in the centre of the city where Leonardo originally intended the sculpture to be placed. A precise date for the move and dedication has not yet been determined. 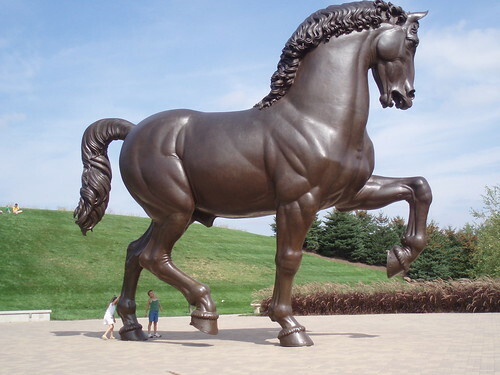 The second horse known as 'The American Horse', was unveiled on October 7th 1999, in the Meijer's garden, a natural park in Grand Rapids, Michigan. The only difference between the two horses at Milan and Meijer's Garden is that the former is mounted on a white marble pedestal whereas the latter is without any platform. 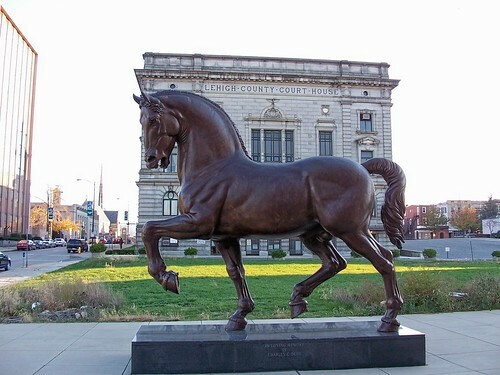 A third horse was installed on Oct 5, 2002 at the Community Art Park (Renamed Charles C. Dent Memorial Garden) adjacent to the Baum School of Art, Allentown, PA, USA. It is a twelve feet bronze replica and is dedicated to honour Charles Dent. A fourth, eight feet bronze replica, was unveiled on 15th September 2001 in the Piazza della Libertà, Vinci, Italy - the birth town of Leonardo. As mentioned earlier in this post, another 24 feet high replica, but of a different artistic interpretation of the da Vinci's designs was also constructed. Made of steel frame with special resin coated fibreglass, to make it look like bronze, it consists of six pieces which are transportable and can be re-assembled. This sculpture commonly known as 'Sforza Horse' or 'Sforza Monument' has been displayed at different museums around the World. The gigantic 24 feet high fibreglass horse made its first appearance during the "The Mind of Leonardo" exhibition held from 16 August to 2 December 2007 at the Museum of Modern Art, Debrecen (MODEM), Hungary. The 'Sforza Horse' was then put on display at an exhibition - "Leonardo: 500 Years into the Future" organised by the Tech Museum in from September 27, 2008 to January 25, 2009. 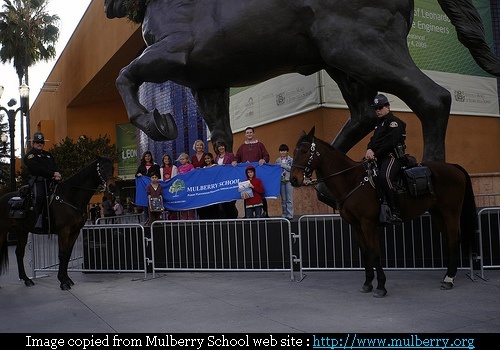 As a part of the exhibit, the organisers had held a competition amongst school children to give a suitable name to the horse sculpture. Finally the name "Ambrogio" suggested by 5th Grade students of local Mulberry School was selected. After the display at Tech Museum, San Jose, the 'Sforza Horse' travelled to Rome where it was installed at the prestigious Palazzo Venezia from May 1 to August 30, 2009 during the exhibition "The Mind of Leonardo". 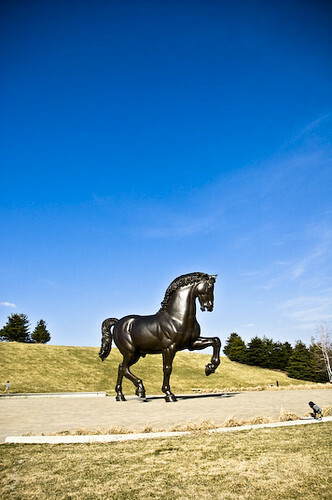 Last known destination of 'Sforza Horse' was in the inner Sifly Piazza of High Museum of Art, Atlanta, where it was displayed from Oct 6, 2009 to Feb. 6, 2010 for the exhibition "Leonardo da Vinci - Hand of the Genius". To place the horse in th inner courtyard it had to lifted in pieces by a crane over 70-foot building at the High Museum. Installation and Time Lapse Videos can be seen at the web site of High Museum of Art. Present location/status of the fibreglass horse in not known. Great pics! I enjoyed this post.